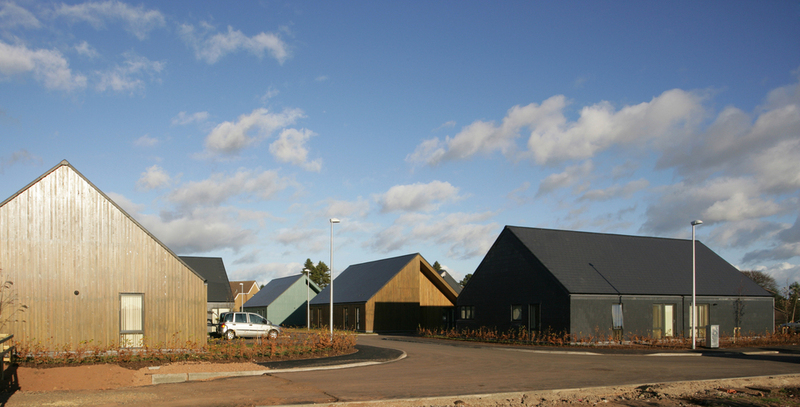 Working with the Scottish Borders Council, the NHS and Berwickshire Housing Association, OCA designed 14 semi-detached houses and a shared services facility for people with disabilities at Duns. The houses are clustered around a new quiet street. All the houses are set out around a ‘tartan grid’ which creates a varying relationship between houses and the road. Some houses are set back further from the road than the convention, whilst others are set close to the road edge. There is also a mixture of gables and eaves adjacent to the road which adds to the streetscape character. The commonly understood character of a home is created by designing duo pitched roof form with gables at either end. OCA’s urban design framework for the surrounding area will ensure that the care facility will integrate into areas of future social and private housing. Care Service Providers: Community Integrated Care.